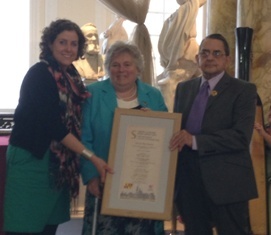 Congratulations to Ann and Alan Davies of Llandaff North who have won The Owain Glyndwr Seren Awards. The award, launched by Cardiff Council last year, is in it’s second year and named after one of Wales most famous and celebrated sons – Owain Glyndwr. The award was created to reward those who have served their community and who may have shown exceptional courage. Ann and Alan were nominated by Dilwar and Siobhan for their hard work throughout Llandaff North, including managing Llandaff North Community Centre which they helped set up 25 years ago.